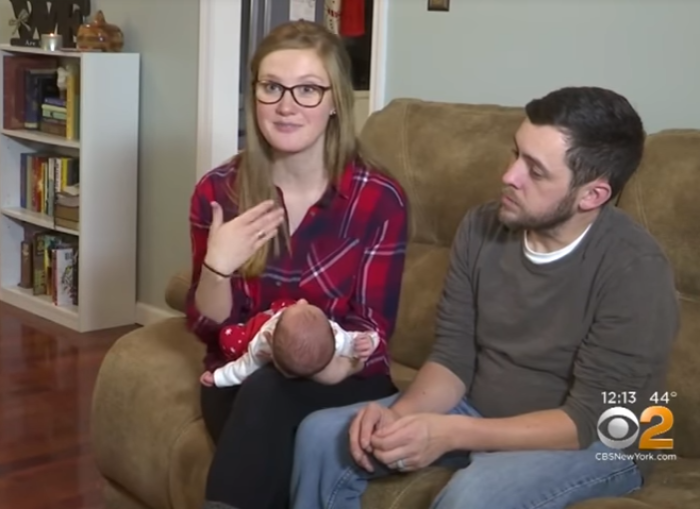 A 26-year-old Tennessee woman, who was unable to conceive a child with her husband, is thanking God for an early Christmas gift after she gave birth to a baby girl who spent 24 years as a frozen embryo. "We're just so thankful and blessed. She's a precious Christmas gift from the Lord," the new mother, Tina Gibson, told CNN about her daughter, Emma Wren Gibson, who was born on Nov. 25. "We're just so grateful." Emma, who the University of Tennessee Preston Medical Library has described as the longest-frozen human embryo to successfully come to birth, comes after seven years of marriage between Tina and her husband, Benjamin, 33. Benjamin is infertile due to cystic fibrosis. "My husband has cystic fibrosis, so infertility is common," Tina told CNN. Emma was conceived some 18 months after Tina was born, WISHTV reported. She was cryopreserved in 1992 before being transferred to Tina's uterus earlier this year through frozen embryo transfer. The couple, who had found peace with their infertility and had been fostering children, are now happy with their little "miracle" thanks to embryo adoption. "Emma is such a sweet miracle," Benjamin told CNN. "I think she looks pretty perfect to have been frozen all those years ago." And despite not sharing any genes with his new daughter, he said: "As soon as she came out, I fell in love with her." The young couple's journey into embryo adoption was made possible by a faith-based organization founded in 2003 called the National Embryo Donation Center located in Knoxville, Tennessee. "When couples go through in vitro fertilization, there are often remaining embryos. Those are frozen and stored for later use. An estimated 700,000 to over 1,000,000 human embryos are stored in the U.S. right now," the organization explains on its website. "When couples decide that their family is complete but still have embryos remaining, there are a few options. They can donate the embryos to research. They can thaw them and let them die. Couples can keep them frozen or they can donate them to a couple who is unable to conceive. A lot of people believe embryo donation is the most life-honoring solution," the organization adds. "We say that our reason for existence is to protect the sanctity and dignity of the human embryo," Mark Mellinger, marketing and development director for NEDC, told CNN. "We are big advocates of embryo donation and embryo adoption." So far, their adoption program has resulted in about 700 pregnancies. "I will always remember what the Gibsons said when presented with the picture of their embryos at the time of transfer: 'These embryos could have been my best friends,' as Tina herself was only 25 at the time of transfer," Sommerfelt added. Mellinger told CNN that couples adopting embryos pay less than $12,500 for a first try.